We’d love your help. Let us know what’s wrong with this preview of Upstarts & Outcasts by Valerie Green. The popular view of Victoria's genteel history—all aristocratic colonists and Royal Navy dances—is about to be exploded. Yes, there were wealthy and well-born settlers, but the city's pioneers also included madams and murderers, seamstresses and saloonkeepers, who would never have been seated at the dinner tables of the upper class. But all these people, upstanding citizens The popular view of Victoria's genteel history—all aristocratic colonists and Royal Navy dances—is about to be exploded. Yes, there were wealthy and well-born settlers, but the city's pioneers also included madams and murderers, seamstresses and saloonkeepers, who would never have been seated at the dinner tables of the upper class. But all these people, upstanding citizens or impudent criminals, made their mark on the life of the little settlement perched on the Pacific; the New World meant a fresh start for everyone. 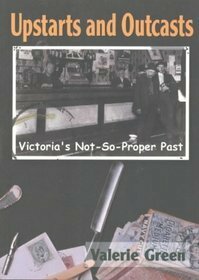 In Upstarts & Outcasts, Valerie Green has collected a rich variety of stories, including those of Arthur Bunster, the bombastic brewer; Soue Kee, the laundryman who served the fleet; Ellen Timmens, the disgruntled housemaid; Mr. Badger, the butler with bad feet; and Stella Carroll, the bawdiest of the many brothel owners—to mention just a few of the fascinating characters of Victoria's early years. To ask other readers questions about Upstarts & Outcasts, please sign up.